Apple's event in San Francisco today isn't only about the Apple Watch. 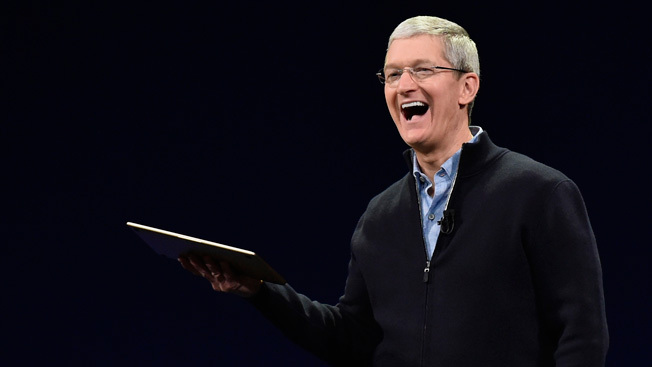 CEO Tim Cook started the product demonstration with a quick update on some of the company's latest devices and services, and the numbers are rather astonishing. Of course, Apple did get to the watch, and revealed that they are set to open for pre-orders starting April 10, in stores April 24, and they will retail for between $350 and $17,000—for the top gold model. Let's start with its flagship, the iPhone. Apple now says it has sold more than 700 million of them since the product launched in 2007. Apple's latest-generation phones contributed to that number. The iPhone was the No. 1 selling phone in the world last quarter. Apple saw a 50 percent growth in phone sales last quarter, compared to industry growth of 25 percent. As for customer satisfaction with the device, Cook said it was at an "unheard of" 99 percent. Apple Pay was perhaps the biggest new service to come to the iPhone last year, allowing people to pay through their phones at stores and elsewhere. Since launch, Apple Pay has gone from 6 banking partners to more than 2,500. The number of retailers accepting Apple Pay tripled to 700,000. Coca-Cola plans to have 100,000 vending machines capable of accepting Apple Pay by the end of the year. Currently, 40,000 of them accept it. Every major car brand is committed to incorporating Apple CarPlay into their automobiles, with 40 new models planned this year alone. Apple finally brought HBO Go to Apple TV, which will charge $15 a month for the streaming version of the cable network. Apple TV has 25 million users now. Also in news not related to watches, the new Macbook is the thinnest yet at 13 millimeters, and it's the lightest at 2 pounds.